Or Anywhere Else In Your Home? GroutPro makes your old tiles look like new again. When you want your tiles and grout to look like new again you want to be sure that the professional you choose is a leading expert … for amazing, guaranteed results AND to help prevent any shower leaking issues. Tiles and grout is all we do and that’s one of the reasons why we’re Australia’s top experts and the biggest in Australia. 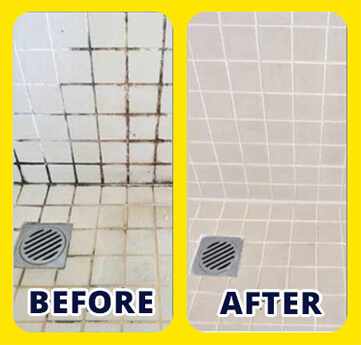 Whether you want your tiles and grout cleaned, repaired, protected or grout recoloured, we have specialists across Australia who can make those grubby tiles look like new again. When you want an amazing result, you want to talk to specialists NOT generalists. We don’t clean carpets, spray for insects or clean toilets. Tile and grout restoration is what we focus 100% of our energy on so you can rest easy knowing that we have the expertise to produce an amazing result. If we find damage we can repair it immediately – no calling in other trades. Try asking a carpet cleaner to replace a tile or repair your grout. On Time, Respectful and FAST! Your time is valuable – we understand that. That’s why we always show up on time and keep you fully informed of our progress on your cleaning, sealing or repair work. We’ll get the job done fast, clean up after ourselves and leave you with a sparkling clean result. 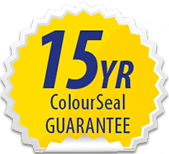 Our ColourSeal service comes with a *15 year guarantee. If at any time during that period the colour deteriorates we’ll fix the problem FREE (see conditions). And – with our tile & grout Clear Penetrating Sealing service we guarantee that your tiles and grout will stay stain resistant for up to *10 years or we’ll retreat the surface FREE. Our Customer Satisfaction Guarantee is second-to- none. Dan from GroutPro Southern Bayside provided a great and timely service in restoring the bathroom tiles throughout our home. The finished effect looks exactly like the example photos on the website. All done with a minimum of disruption and at a competitive price – so much better value than having the tiles and/or grouting replaced. Looks like new! *$319 Including gst minimum charge for 40m². 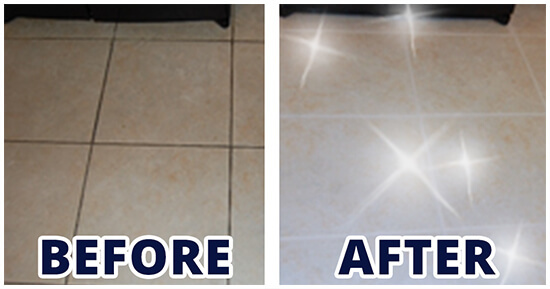 You won’t believe the difference a GroutPro professional clean can make until you see the difference with your own eyes. GroutPro can also enhance the value of your home by replacing dirty mouldy old silicone, replacing damaged tiles and grout, or by regrouting an entire floor. Once the cleaning and repairs are done we can seal it to keep it easy to clean and looking new. We specialise in repairing, and cleaning all types of tiles including ceramic tile, porcelain tile, slate tile, terracotta tile, granite & marble tile, sandstone, travertine, and many other stone tile surfaces. Plus, we can also seal most types of tiles to offer further protection from staining. Traditional tile and grout cleaning processes just remove surface grime. 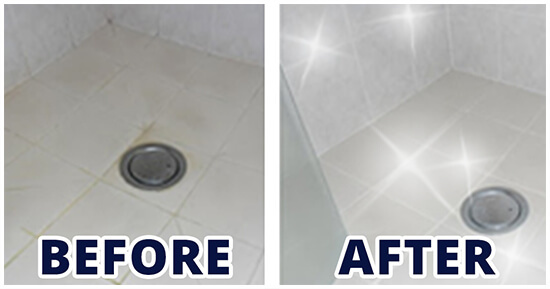 Our intensive cleaning process uses a specialised tile and grout cleaning solution, mechanical scrubbing, then a deep Turbo Power clean which removes ground-in soilage that occurs over time. This is the key to restoring your tiles and grout to their original beauty. Repair’s can be carried out in your choice of grout colouring and silicone colouring to match in the old with the new so repairs are not easily visible. We offer a wide range of grout and silicone colours to choose from. 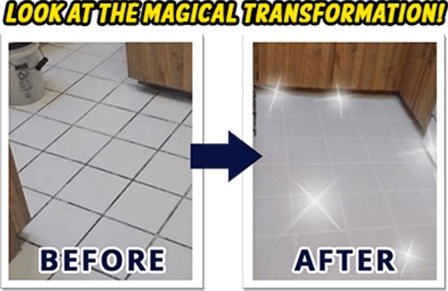 GroutPro’s advanced sealing products not only enhance the appearance of your tile, stone or grout floors, they also reduce bacteria and make it easy to clean and maintain. Whether it be bathroom tiles, kitchen floors or splash-backs, or any other tiled or stone surface (either indoors or outdoors) our tile and grout repair and cleaning service can be used. Our range of professional products will make a huge difference to the appearance of your floor and wall tiles Plus, they’ll now be easy to clean and maintain. on 1800 822 459 (Australia-wide). Take a look at the AMAZING TRANSFORMATIONS! WARNING! 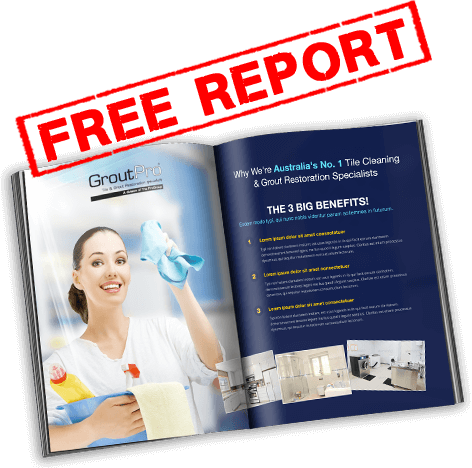 Don’t engage a Tile or Grout Cleaner until you read this! A Tile & Grout Cleaning Company! Tile and grout cleaning, and restoration are an advanced skill that requires a specialist in tile & grout restoration … not simply a generalist who has the right equipment. A poorly performed job can lead to water damage, staining of surfaces, colours that don’t match, or chipped tiles that can cost you $1000’s to repair. You may be paying for a job that just doesn’t get the result you want. Or – worse still, is incomplete. Don’t take the risk. 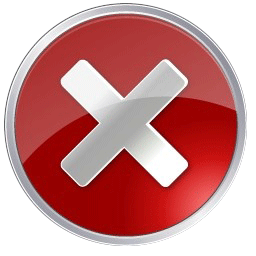 Grab your free report and discover the 3 biggest mistakes to avoid. Andy of GroutPro performed miracles on my old floor tiles. I was seriously thinking about replacing them as I just couldn’t get them clean. Now, I love my almost new looking tiles and grout. Andy arrived early, left late and really went ‘the extra mile’ with his workmanship and service. You should have seen the dirty water after he lifted 15 years of locked in dirt from 3 dogs and a family! I highly recommend Andy to professionally clean your tiles. He does a really thorough job with amazing results. 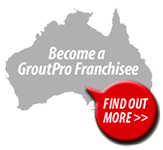 Many Thanks for Chris from GroutPro Browns Plains for your wonderful service. He was extremely professional with on time arrival and service and gave that little bit extra. So much appreciated. I am very happy with my new clean tiles & grout. I will be in touch again when the en-suite shower is finished. I will certainly recommend your service to anyone I know who is thinking of getting their grouting cleaned & sealed. easier and faster than you think!